A distinction must be made between an animal's phenotype (outward appearance) and genotype (actual genetic composition). A similar outward appearance between animals can often be the result of a variety of unrelated factors. 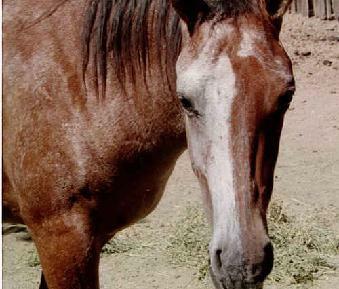 For example, in Pinto/ Paint horses, all are outwardly white spotted (phenotype). However, the various white spotting patterns are now known to result from several different unrelated genes (genotypes). Since the genes are located at different loci, it is only coincidental that the genes produce a similar white-spotted outward appearance. Occasionally, spotting even occurs due to a coat developmental abnormality, a mosaic or chimera condition, or a displaced pigment patch, and is thus not the result of any genes at all. Some phenotypical (outwardly appearing) brindle patterns can result from mosaicism or chimera. Since a specific gene is not involved in producing a mosaic or chimera pattern, these types of brindle patterns usually do not reproduce themselves, unless the original chimera condition can be duplicated. However, there is evidence for a gene responsible for producing some of the other phenotypical brindle patterns based on the production records of some brindle horses. Brenda's base color (picture at top of page) is either dark mahogany bay or light seal brown. While she is registered as a Brindle Dun with the IBHA (International Buckskin Horse Association), she actually only has the Brindle pattern. She does not have the dorsal stripe or leg barring associated with Dun Factor type horses. Brenda is of unknown breeding, and was foaled in approximately 1984. 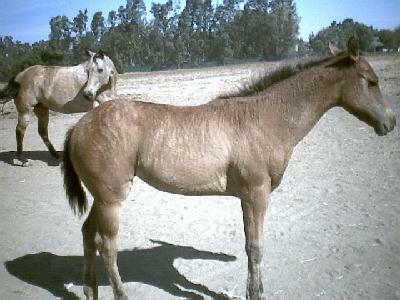 She is registered with the IBHA (T-14356) as a Brindle Dun, and with the ABRA (T-9049) as a Buckskin. Brenda has produced five foals to date, 3 of which have had her pattern. This indicates there may be a gene involved, which is inherited dominately, since approximately 50% of her foals have inherited the pattern from her. In addition, one of her daughters has also produced a brindled foal, indicating the pattern is capable of being passed from generation to generation, also lending support to the idea of gene for brindle. Below is a summary of Brenda's offspring. 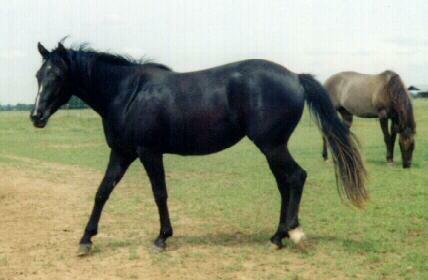 1988 Red Bay Brindle daughter of Brenda Batty Atty by an unknown stallion. Because she is a red bay (clear red color with little smuttiness/ sootiness/ countershading), darker hair is prevented from appearing on the body, so you cannot see any darker striping on her coat, even though she has coat texturing like her dam. 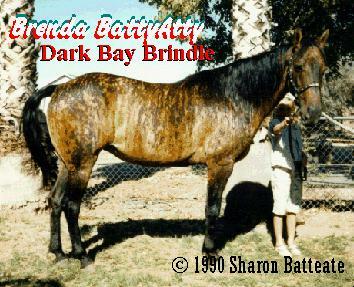 Her dam "Brenda" is a dark bay or mahogany bay base color, which allows darker hairs to appear on the body, so the brindle striping can be seen. Brenda's Baybe was not able to be registered with the buckskin registries due to lack of visible striping, so she was registered with the AQPA (P-3413). Brenda's Baybe had three foals before she had to be put down due to an accident from trailer loading. Pictures were not taken of her first foal in 1993. Her second foal in 1994 was a 2 week premature filly pictured below on the left. A definite brindle, she had coat texturing and two colors (buff and gray) apparent in her coat at birth. Her third foal in 1995 was the mahogany bay colt (now gelded) pictured below on the right. While he showed countershading striping down his back and some texturing in his coat as a foal, he ended up being an ordinary non-brindle mahogany bay. He did retain his countershading stripe down his back, but this should not be confused with brindling. Rather, sooty/ smutty/ countershading (darker hair mixed in on the body) is just one of the factors that seems to be involved in helping make a brindle pattern visible. 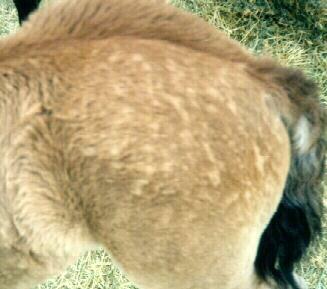 Many foals will exhibit coat texturing or primitive striping, which they loose as they mature. However, by comparing these two pictures, you can see that the brindle coat texturing has a slightly different appearance. It has more of an irregular "moth-eaten" look caused by the different hair types or lengths of hair. 1993 Fading Black colt out of Brenda Batty Atty by the grullo AQHA stallion Miracle Moon. Non-brindle. Registered with the Half Quarter Horse Registry of America (9074 1/2). Now deceased. No offspring. 1998 Black filly out of Brenda Batty Atty by the seal brown roan AQHA stallion Malbec's Silvery Moon. Non-brindle. Registered with the Half Quarter Registry (12156 1/2). She has had two foals to date by the AQHA stallion Ima Star Brindle Bar, a mahogany bay Brindle carrier from another line of Brindles. One of her foals is a seasonal brindle. However, since she is non-brindle herself, the pattern resulted from the sire's side. 2000 Red Bay Brindle filly out of Brenda Batty Atty by the mahogany bay AQHA stallion Ima Star Brindle Bar. Millie is registered with the Half Quarter Registry (12502 1/2). Opinion of color at 1 month (left): Since she doesn't have a dark stripe down her back like most mahogany bay foals do at birth, this filly will probably shed out the same color as Brenda's Baybe above. Unfortunately, while she will have the brindle coat texturing, she will probably not exhibit the darker striping like Brenda Batty Atty does. Note the "moth-eaten" appearance caused by raised tufts of hair, indicating different hair lengths characteristic of the pattern in this family group. Observation of color at 1 year (right): An interesting development occurred in Millie's color. While she did not develop any darker streaking like her dam Brenda, she instead developed areas of white hairs in the coat, and exhibits a face pattern characteristic of chimera patterns. Neither parent exhibited either gray or roan genes, so the white hairs must be resulting from some action of the brindle pattern itself. There is a picture of the dam Brenda at the top of the page. The sire was a bay with only a star, and no other white hairs on the body at all. He was out of my other brindled buckskin mare, and I thought he might be a carrier of her type of brindle pattern (seasonal brindle) because of his unusual curly texturing on his legs, and his sparser mane and tail (like his dam). However, he doesn't actually exhibit any striping himself (not even seasonally). Millie also exhibits the curly texturing and sparser mane and tail, so she is perhaps a combination of the two types of brindled patterns. 2003 Red Bay Brindle filly out of Brenda Batty Atty by the mahogany bay AQHA stallion Ima Star Brindle Bar, making her a full sister to Millie above. However, it appears she has only inherited Brenda's type of brindle pattern, and is probably not a combination of both types as Millie probably is. Note the "moth-eaten" appearance caused by raised tufts of hair, indicating different hair lengths characteristic of the pattern in this family group. Girly is registered with the Half Quarter Registry (12619 1/2) and the IBHA (A-23667). The Brindle pattern consists of a watery or drippy looking striping (sometimes just partial striping) over the body of an animal. It is more commonly seen in dogs or cattle. In horses, the pattern is extremely rare. Brindle has occurred in such diverse breeds as Arabians, Thoroughbreds, Mustangs, Quarter Horses, Tennessee Walking Horses, German and Bavarian Warmbloods, Russian Horses, Spanish Horses, and also in Donkeys and Mules. Many people confuse the Brindle pattern with Dun Factor markings (stripe down the back, barring on the legs, and occasional regular-spaced striping down the ribs). At one time, it was thought Brindle was a just a variation of Dun Factor. Indeed, there have been many examples of horses that were probably carrying both Dun Factor and Brindle. However, as can be seen from pictures of numerous Brindles in our slideshow, many do not have any Dun Factor markings whatsoever, indicating the two patterns are probably distinct genetically. Brindle horses also have texturing in their coat, similar to that seen in some Appaloosa horses. The pattern seems to be inheritable, especially in terms of coat texturing, but the expression of the darker or more intense pigment to make the pattern visible is highly variable, and even varies with individual horses seasonally / yearly. Sometimes the pattern seems to be composed of dark hair (black or brown), sometimes of white hair (roan or gray). Written information was last updated © October 6, 2003. Unless otherwise noted, the articles on this site are by J. Sharon Batteate jsbatteate@aol.com The pictures and information on this site are for informational purposes, in order to educate people on the Brindle pattern. The pictures and information on this site are copyrighted. All rights reserved. No part may be reproduced, stored in a retrieval system, or transmitted in any form or by any means, electronic, mechanical, photocopying, recording, or otherwise, without the prior permission of the copyright holders.